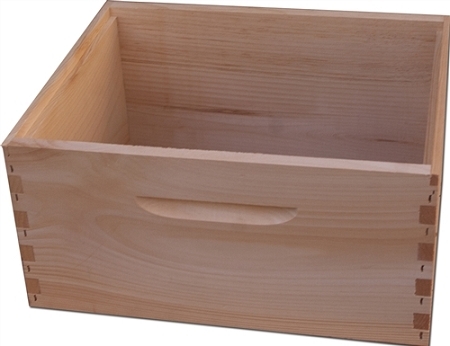 Manufactured with kiln-dried white pine lumber. 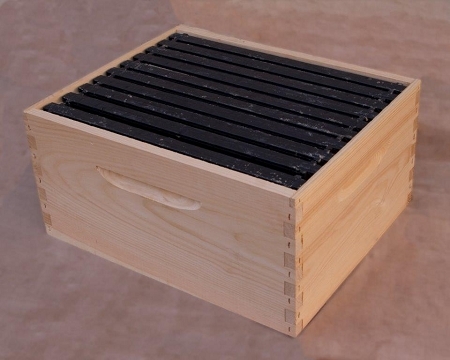 These 10-frame hive bodies have box joint corners and are stapled with 2 inch staples so it will not come apart. Box height is 9-5/8" and accommodates 10 standard deep frames (9-1/4"). (Frames not included). This hive body comes completely assembled. Optional Hot wax treatment is available. Hive body is boiled in paraffin wax to remove all moisture from wood, for $8 additional (quantities may be limited). Water will bead off wood and not penetrate, so no chance of rot or bug damage. No need to paint.